Ethanol fuel mixtures have "E" numbers that describe the percentage of ethanol by volume: For instance, E5 is 5 percent ethanol and 95 percent petrol. But vehicle owners have concerns about the supply and quality of E5 petrol. * Consumers are worried about the quality of E5 petrol. What is your opinion about it? E5 or E10, these bio-fuel products have been widely consumed in many countries like the US, the Republic of Korea, India, Thailand, the Philippines and in Europe. Many Western European countries have been using E5 since the 1970s. 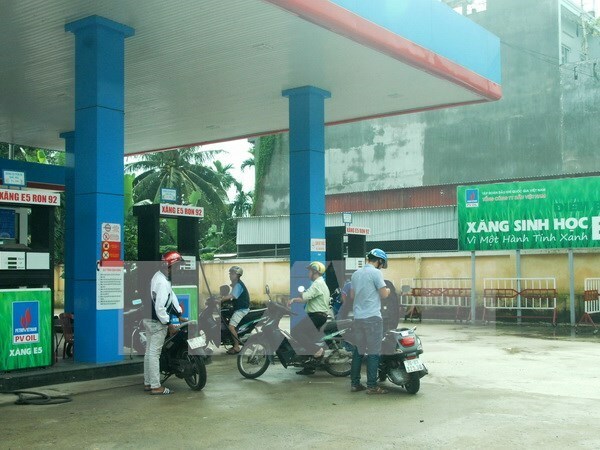 Meanwhile, in Vietnam, BSR, through the Central Bio-fuel Company, supplies ethanol for processing E5 RON92 petrol in the local market. The E5 RON92 petrol is processed under a strict quality management system meeting local and international quality standards. E5 RON92 petrol now has quality as good as or even better than RON92 petrol but sells at a price of 330 VND per litre lower than normal petrol. However, the product is not popular or consumed widely in the local market. * There are big gaps between the volumes of E5 petrol sold in the northern, central and southern regions. Why is this? * E5 petrol is to be used nation-wide from December 2015. What are challenges in supplying the product to the market? Now plants with high ethanol production capacity supply large volumes of the material to plants processing bio-fuel. For instance, the Vietnam National Oil and Gas Group (PetroVietnam)'s Central Bio-fuel Factory, in which the largest investor is BSR with 61 percent, went on stream with a designed capacity of 100 million litres of high-quality bio-fuel per year. But the plant has been operating at 10 percent capacity due to the low demand in the local market. The factory is expected to increase its production if the market has higher demand. It will increase by 60-70 percent and even run at 100 percent capacity if the market needs it. * What measures have been contemplated to increase bio-fuel sales? BSR has asked PetroVietnam for support for its negotiations with distributors, including Petrolimex and Saigon Petro, on distribution of ethanol-blended petrol.